Former longtime Yu-Gi-Oh! licensee 4Licensing Corporation announced yesterday evening that it has filed for Chapter 11 bankruptcy protection. In a terse press release, the company once known as 4Kids Entertainment Inc. stated that its “management does not currently anticipate any recovery for shareholders.” Ouch. After selling its animation production arm and the Yu-Gi-Oh! License to Konami in 2012, 4Kids pivoted, reincorporating as 4Licensing Corporation and entering the sports licensing industry. The company’s flagship product was isoBLOX, an impact protection and absorption technology that it sought to sell to make protective sports equipment. At the time, the company also still owned the rights to various children’s entertainment properties, like Dinosaur King, Robot Monkeys, and Tai Chi Chasers. Elik Álvarez, one of a team of composers who has written music for every Yu-Gi-Oh! anime series and film produced by 4Kids Entertainment and 4K Media, was interviewed live today on the Everything Geek Podcast. Álvarez and host Ruari Williamson spent 40 minutes talking about his decision to pursue music composition as a career, his favorite types of Yu-Gi-Oh! music, and even some juicy tidbits about the upcoming Yu-Gi-Oh! ARC-V series and 2016 Yu-Gi-Oh! movie. This post contains highlights from the show. Originally from Venezuela, Elik Álvarez has been surrounded by music his entire life. His grandfather, who emigrated from Ukraine to Venezuela, embraced classical music and shared that love with Álvarez. Álvarez’s father gave him his first record, the Star Wars soundtrack by John Williams, which further fueled his interest in orchestral music. Growing up, Álvarez studied piano for almost 10 years. And like so many young people with an interest in music often do, he joined a rock band. When he was 15 years old, Álvarez heard the theme song for The Simpsons TV show and thought it would be cool to do an arrangement of the song with his band. After that, he began perceiving film music with a more critical ear. After graduating from Berklee College of Music, Álvarez moved to Los Angeles looking for work and was fortunate enough to land a job working on 4Kids’ Kirby: Right Back at Ya!, Ultraman Tiga, and Teenage Mutant Ninja Turtles. When Yu-Gi-Oh! The Movie was developed, Álvarez was invited to work on the project, which opened the door for him to then compose for the Classic Yu-Gi-Oh! TV series and all of its spin-offs. All of the Yu-Gi-Oh! series called for Elik Álvarez and the shows’ other composers to write very melodic pieces. Over the years that Álvarez and the team of Yu-Gi-Oh! composers have worked with 4Kids and 4K Media’s producers, they have developed a strong sense of trust with one another. The producers extend a great amount a freedom to Yu-Gi-Oh!’s composers, even more so than many producers of other big-name projects that Álvarez has worked with. “One particular very good thing about the series is that we never get any temp tracks,” said Álvarez, referring to the temporary filler music that editors, directors, and producers stick in when editing video footage to get a sense of how the scene will turn out. “So, I never hear any of the Japanese versions, and I never hear any other versions tried, like ‘Okay, this is what you should do.’ We just get plain visuals with dialogue and some sound effects and we need to create the music from scratch. Álvarez has worked with all types of directors and producers, from those who rely strictly on temp tracks to those who offer him an extensive amount of freedom. He recognizes that ultimately, the strength and quality of the music rest on the shoulders of the composers. Elik Álvarez and the other Yu-Gi-Oh! composers have written such an immense amount of music under such tight deadlines. So when he was asked about his favorite pieces, it was challenging for him to point to specific ones. “It’s a very tough question. Whatever I answer right now, it could be different maybe in a month or a year,” Álvarez joked. “I wrote the opening sequence in the Yu-Gi-Oh! movie, the first one. That was very special,” said Álvarez. Álvarez related his love for his work on Yu-Gi-Oh! ZEXAL to the freedom that he was given while working on it. Álvarez also expressed his enjoyment doing the rock-based score for Yu-Gi-Oh! GX, which he worked on with his then guitar-playing writing partner Freddy Sheinfeld, as well as the more sophisticated scores of 5D’s. “That show I really like. Really, really like it. It’s very, very strong,” he said. “I like the story and the plot that’s going on over there. For that one, we were writing so much as well. What can I tell you? There are many great action cues. This week, Álvarez just finished the trailer for the upcoming 2016 Yu-Gi-Oh! movie. Having only done the music for the trailer, he doesn’t know exact details about the movie. However, Álvarez noted that the trailer will premiere at San Diego Comic Con. As for the movie itself, “We should start working on music for the movie probably [in] September, October. We don’t know, I can’t say anything,” explained Álvarez. “That project with Yu-Gi-Oh! is coming. I don’t know any details about the movie, if it’s going to be a big release, if it’s going to be a limited release, but I think we’re pretty excited about this one. It’s been a long, long wait, but 4K Media (Konami) has at last finished subbing Yu-Gi-Oh! 5D’s. Crunchyroll today added episodes 111 through 154 in all of their uncut, Japanese glory to its library, bringing the series to its highly anticipated close. This last set of episodes includes the Ark Cradle storyline beginning in episode 130, which was not fully adapted in the English-dubbed version of the show. The episodes are currently available to Crunchyroll’s premium members worldwide (except most of Asia). Yu-Gi-Oh! 5D’s has the honor of being the first and only Yu-Gi-Oh! anime series to receive a complete, official subtitled release, and only the second Japanese series formerly licensed by 4Kids Entertainment to get such a treatment (the first being Sonic X). My page for Yu-Gi-Oh! 5D’s subtitled streams have been updated with these newest videos from CR. The latest subbed episode of Yu-Gi-Oh! 5D’s on Hulu and YUGIOH.com is still episode 135. There’s no word yet when these platforms will receive the remaining episodes of the show. Toonzaki.com, a hub for legal and official streaming anime videos, closed its doors late yesterday night, redirecting all traffic to YUGIOH.com. The website, which was originally owned by 4Kids Entertainment and sold to Konami’s 4K Media after the Yu-Gi-Oh! lawsuit, opened in September 2010 and was intended to be a video portal where casual anime fans and passersby could find the majority of anime titles streaming on the web together in one convenient place. Not only were the titles that 4Kids had licensed included, but so were shows from other licensees and content partners, including uncut, Japanese-language series. The Yu-Gi-Oh! series — and Yu-Gi-Oh! 5D’s in particular, whose new episodes were premiering on TV at the time of Toonzaki’s launch — were centerpieces of the website. In its early days, Toonzaki was rife with potential as it regularly updated with new programming, engaged with fans on Facebook, and even made a big showing at New York Comic Con. Beginning in mid-2012, after the Yu-Gi-Oh! lawsuit wound down and ownership of the website was in transition, Toonzaki began to see a great deal of neglect, resulting in nonfunctioning videos, broken links, missing images, and a general lack of digital housekeeping. Its last significant update came in April 2013, which patched up those problems and added some new shows. But since then, the website once again fell into disrepair before finally shutting down. Toonzaki was an ambitious undertaking from 4Kids that was unveiled in July 2010 in an episode of Anime News Network’s ANNCast podcast. The site opened for business on September 15, 2010. At its inception, Toonzaki’s only non-in-house content delivery partner was Hulu, which was the home of many series from FUNimation, the Anime Network, and other anime content owners. Later, Toonzaki also partnered with Crunchyroll to stream many of its titles. At the time, the partnership raised a few eyebrows since Crunchyroll wasn’t known for sharing its ad revenue with just anyone. Toonzaki made considerable efforts to reach out to fans with Facebook posts, polls, and contests, and often rewarded them with new content for participating. The website only began streaming subtitled episodes of Yu-Gi-Oh! 5D’s after a successful “Facebook Fan Drive,” which reached its goal of 300 fans in a matter of hours. Toonzaki was well known for promoting its shows on its homepage with witty one-liners, even crowdsourcing new taglines from fans. But few could have predicted that the innocent attempt at fan engagement would result in a legion of Yu-Gi-Oh! Abridged fans descending upon Toonzaki’s Facebook page, all calling for CARD GAMES ON MOTORCYCLES to be used to promote Yu-Gi-Oh! 5D’s. And even fewer could have predicted that 4Kids would indeed adopt the catchphrase as an official promo line. The first significant sign of trouble for Toonzaki came in late August 2012 when the website abruptly removed all of its Yu-Gi-Oh! videos as part of a transition that involved server changes and that disabled the website for extended periods of time. Nearly three full months would pass before Toonzaki came back online in November 2012, but by then, significant damage had been done. At one point, Toonzaki was among the top results for search engine queries for Yu-Gi-Oh! videos. But no more. Things would never be the same again. Even after vestiges of the Yu-Gi-Oh! lawsuit were gone and new episodes of Yu-Gi-Oh! ZEXAL were being uploaded to Hulu again, Toonzaki still had trouble keeping up with the updates. And although Toonzaki did its best to clean up and stay relevant, it was clear that its best days were behind it. Toonzaki never became the hub for anime streaming, but today, the landscape of anime availability on the Internet is leaps and bounds beyond that of Toonzaki’s earlier days. Hulu, which was only a minor player in the anime game when Toonzaki launched, is today a dominant force for all things anime. Even the Japanese producers and studios themselves have learned of the potential of anime streaming and have gotten into the game with DAISUKI. There are more options than ever for both the discerning anime otaku and the casual anime viewer to stay entertained in this social and digital age. And still there is no one single entity that has aggregated the videos from all of these options. Konami has completed a bit of housekeeping on Hulu, moving the videos of all four Yu-Gi-Oh! series from 4Kids‘ account to their new home with 4K Media, Konami’s wholly-owned subsidiary that manages the Yu-Gi-Oh! property rights it bought from 4Kids. The links for all of the episodes remain the same, thankfully. Over on Toonzaki.com, which partners with Hulu to embed the Yu-Gi-Oh! episodes published on the popular video streaming platform, the feeds for the Yu-Gi-Oh! series still haven’t been updated since prior to Konami’s new Yu-Gi-Oh! 5D’s and Zexal uploads two months ago. Worse yet, the episodes all display an ominous message when one attempts to view the videos: “This content is unavailable for playback.” Ugh, have they been like that for sometime now, or is that a result of the videos’ migration on Hulu? Either way, Toonzaki has really fallen into neglect, with missing images, nonfunctional videos, and a lack of fresh content and homepage updates all plaguing the once promising anime video portal. On a more positive note, Saban unleashed a brand-new look for MyVortexx.com, the official website for its Saturday morning block Vortexx on The CW, back in mid-February. But wait — dedicated pages for Yu-Gi-Oh! and Yu-Gi-Oh! Zexal are conspicuously missing from the website. (Or are they?!) Don’t worry, I’m sure something big is coming that will please many fans… Stay tuned! Today, the U.S. Bankruptcy Court for the Southern District of New York approved 4Kids Entertainment’s Chapter 11 reorganization plan, sending the former longtime licensee of the Yu-Gi-Oh! franchise out of bankruptcy protection. 4Kids’ plan grants all of its creditors full payment in cash on their allowed claims while still preserving its equity. 4Kids’ New York-based parent company will now merge with a newly formed Delaware subsidiary, with the Delaware subsidiary remaining as the surviving company. 4Kids will retain all of its common stock during the reincorporation, which will be automatically converted into the common stock of the Delaware entity. The reorganized 4Kids emerges with eight employees. It will remain in the licensing business, having retained numerous properties during the bankruptcy process, including several animated children’s titles like Chaotic and Dinosaur King. 4Kids intends to continue adding new properties to its portfolio. However, because Konami and Saban acquired its production and broadcast teams respectively, 4Kids itself will no longer produce or distribute any of its properties and the relevant subsidiaries that managed these operations will be dissolved. Additionally, 4Kids will be venturing into the world of sports licensing, with newly appointed heads of the reorganized 4Sight subsidiary Mark Panko (President) and Stacy Weiland (COO) taking the helm. 4Kids intends to pursue product design and development projects and consumer goods production. Longtime 4Kids exec Bruce Foster will serve as the interim CEO and CFO of the reorganized 4Kids parent company. 4Kids’ Board of Directors will be trimmed to three: Jay Emmett (Chairman), Duminda DeSilva, and Wade Massad. 4Kids’ reorganization proceedings advanced at an accelerated pace. The company first unveiled its plan on October 5, which the court deemed acceptable on October 30. 4Kids began soliciting acceptances from its shareholders and creditors for the plan on November 7, with the voting and objection period lasting until December 5. The votes were overwhelmingly (99.93 percent) in favor of 4Kids’ reorganization. And what became of the claim by The Pokemon Company International over various alleged “deficiencies” in payments? As I briefly touched upon when the Yu-Gi-Oh! lawsuit first came to light in March 2011, TPCi alleged in early 2010 that 4Kids owed it nearly $4.7 million in royalties and other payments, the amount of which was later adjusted to $6.2 million. 4Kids subsequently conducted its own audit of TPCi, reaching quite the opposite conclusion. Though the parties were supposedly making headway in reaching a resolution, the Yu-Gi-Oh! lawsuit and 4Kids’ bankruptcy brought a halt to the parties’ negotiations. Since the end of July 2012 however, talks had resumed, and earlier this month, both parties agreed to settle, with TPCi receiving $1 million. 4Kids Entertainment entered Chapter 11 bankruptcy protection on April 6, 2011 to defend itself from Japanese Yu-Gi-Oh! licensors TV Tokyo and ADK/NAS, who attempted to seize the rights to the Yu-Gi-Oh! property after they terminated their dealings with 4Kids. On April 6, 2011, 4Kids Entertainment filed for Chapter 11 bankruptcy protection to stop Japanese Yu-Gi-Oh! licensors TV Tokyo and NAS/ADK from seizing the rights to the coveted Yu-Gi-Oh! property after they had terminated their dealings with 4Kids. Since then, a lot of good things have happened to 4Kids, including a victory over the licensors in a lawsuit to retain the Yu-Gi-Oh! rights, an $8 million settlement paid to 4Kids, and 4Kids’ subsequent sale of the Yu-Gi-Oh! property for $15 million. Given the company’s lack of accomplishments in the ever-weakening children’s licensing and advertising markets in recent years, it’s an odd notion that the turmoil from being driven into bankruptcy and the resulting court proceedings have put 4Kids in a position of success that it hasn’t seen for years on end. Not only is 4Kids free from its toxic relationships and able to pay off its creditors in full, but the company is also left with plenty of cash to maintain a healthy equity balance. But what did 4Kids lose in order to attain this position? When 4Kids and the licensors first announced their intentions to settle, I invited you to consider how the parties may have arrived at the $8 million settlement figure that 4Kids received. Today, October 5, 2012, is a turning point in 4Kids’ history. Almost exactly 18 months to the day it filed for bankruptcy protection, 4Kids will be submitting its Chapter 11 disclosure statement, the first step to exiting bankruptcy. The company will reveal its current financial situation and discuss its intentions to reorganize. As we enter this pivotal day — one forever to be inscribed in the annals of children’s licensing, marketing, and programming — let’s revisit my thought experiment in more detail. In July 2010, 4Kids unveiled its plans for Toonzai, a complete rebranding of its Saturday morning programming block on The CW that would serve as a hub for children’s anime. The success of Toonzai would rely on 4Kids’ ability to pick up new shows for the block. As presented during the lawsuit, 4Kids was in discussions with three companies to license new anime: Toei Animation, Dentsu, and Viz Media. These plans ground to a halt due to the lawsuit and bankruptcy. Toei, with whom 4Kids had had a long-running business relationship over the years, refused to license any more of its shows to 4Kids, a decision that 4Kids believed was induced by ADK. Dentsu declined to continue negotiations with 4Kids until after the Yu-Gi-Oh! lawsuit had been resolved. Viz Media agreed to continue informational discussions with 4Kids, but would not be closing any potential deals. The future of Toonzai was bleak. What anime series could have graced us with their presence on The CW? We may never know. Toonzai’s chances of picking up new shows had been devastated, and the block was relegated to a paltry handful of new content and a slew of reruns. It wasn’t only the acquisition of new anime that suffered, however. Prior to the lawsuit, 4Kids had been in negotiations to sell TV broadcasting deals for the Yu-Gi-Oh! series to Nicktoons, as well as to several other overseas networks. These parties, too, backed out under the weight of the lawsuit. In 2011, Yu-Gi-Oh! 3D: Bonds Beyond Time arrived in the United States. The movie saw a limited run in theaters, with digital film distributor Cinedigm holding screenings on February 26 and 27 and again on March 5 and 6. Fans might remember seeing some trailers for the movie posted on 4Kids.TV and 4KidsTV.com that mentioned a home video release. Whatever happened to that? Or was that a dream? No, you aren’t imagining things. There was indeed a trailer for the movie featuring narrator Dan Green, who invited fans to “look for the home video release this fall,” and featuring a mock-up of a video cover with the text “Coming This Fall!” proudly displayed. And indeed, there were Internet retailers offering a Bonds Beyond Time DVD for pre-order, with a July 19, 2011 street date and A&E Home Video listed as the distributor. Some Yu-Gi-Oh! fan sites were quick to declare that the highly anticipated video release of Bonds Beyond Time had come. I, on the other hand, was puzzled by the lack of press and held off on posting an announcement. In April 2011, fans who had pre-ordered the DVD suddenly saw their orders canceled; retailers removed all traces of the product from their virtual store shelves; the trailer disappeared from 4Kids’ websites, never to be seen again; and to this day, there has been no home video release of the movie in the United States. What happened? 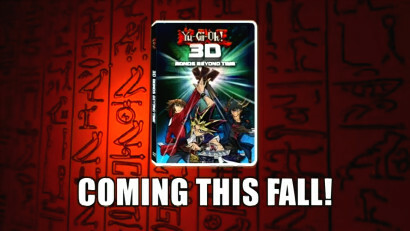 Although some fans questioned the legitimacy of A&E Home Video’s involvement with the Bonds Beyond Time DVD, the lawsuit revealed that 4Kids had in fact been negotiating the licensing of certain Yu-Gi-Oh! home video rights with parent company A&E Television Networks since March 2011. The cancelation of the pre-orders in April was no coincidence, as A&E severed its discussions with 4Kids because of the lawsuit and bankruptcy. Across the pond in the UK, British fans were still treated to both a theatrical and a DVD and Blu-ray release of the film. 4Kids Entertainment International, the London-based subsidiary of 4Kids, was not entwined in the bankruptcy proceedings in the U.S. and was thus able to conduct business as usual, securing distribution rights for the movie with Manga UK. Bonds Beyond Time was screened on May 14 and 21, 2011. The DVD and BD, initially targeted for a May 30 street date, were released on July 25, 2011. The UK’s theatrical screenings were made possible through a partnership with Picturehouse Cinemas and Everyman Cinemas. They were not successful. In episode 4 of Manga UK’s monthly podcast, Jerome Mazandarani, the Head of Marketing and Acquisitions at Manga UK, revealed that the occupancy rate for the 26 screens showing the movie was less than 10 percent. Comparable numbers are not available for the U.S. theatrical release, which saw a limited distribution on 300 screens (up from the originally planned 250), but it’s a safe bet that everyone who participated in this release lost money. The movie’s poor performance puts a damper on the possibility of a future DVD and BD release in the U.S.
On the other hand, the Bonds Beyond Time DVD was Manga UK’s #2 seller in 2011, second to the Akira BD’s nearly 12,000 units. Hmm, there may be hope yet for us Americans. In 2009, 4Kids Entertainment hired Montgomery & Co., an investment bank specializing in mergers and acquisitions, to help it develop a financial strategy in light of the challenging economic climate and 4Kids’ continual loss of revenue. Strategic alliances, mergers, or even outright sales of the company or its assets were all possibilities. 4Kids’ search for investors and suitors continued as it entered Chapter 11, with the company retaining the services of BDO Capital Advisors in June 2011. Although 4Kids had referenced a possibility of an acquisition early on in the bankruptcy, it wasn’t until the preliminary stages of the lawsuit in June 2011 that a name finally emerged: Classic Media. With an already vast library of over 400 titles, including Casper the Friendly Ghost, He-Man and the Masters of the Universe, and Voltron, Classic Media looked to further enhance its offerings by acquiring the rights to the Yu-Gi-Oh! franchise. Classic Media had been in discussions with 4Kids about a possible merger since November 2010. Between January 2011 and March 2011, the pair set the stage for an all cash buyout of 4Kids at a “substantial premium” of its then market value. The merger was to alleviate some of the Japanese Yu-Gi-Oh! licensors’ concerns about 4Kids’ financial state. However, the same month Classic Media and 4Kids were set to sign a letter of intent to begin carrying out the merger, the licensors severed their ties with 4Kids, effectively killing the deal. In November 2011, seven months into the bankruptcy, Classic Media returned to the negotiating table, again offering to buy 4Kids’ entire business. At the time, the lawsuit had still not been resolved and 4Kids was in need of cash, putting Classic Media in the driver’s seat and allowing it to offer a significantly discounted price. 4Kids, lacking a suitable alternative, proceeded to negotiate with Classic Media well into December 2011. Discussions between the pair advanced considerably, so much so that an asset purchase agreement, bidding procedures, and a sale motion had been prepared. Intrigued by the progress that had been made, I reached out to 4Kids for comment, who predictably was unable to offer any substantive comments. On December 29, 2011, the court issued its ruling on the lawsuit. In light of the favorable decision, 4Kids ended its discussions with Classic Media, believing that it now had what it needed to leverage a better price elsewhere. While it’s not clear exactly how much Classic Media offered 4Kids during its second crack at buying the company, 4Kids later noted that Saban’s $10 million offer for its Yu-Gi-Oh! property alone was “substantially greater” than Classic Media’s offer for its entire business. 4Kids did well to reject Classic Media’s second offer. But what about the original offer from March 2011? Where would Yu-Gi-Oh! be today if the parties had consummated the deal? In July 2012, Classic Media was purchased by DreamWorks Animation for $155 million. Contrary to what you may have heard elsewhere, 4Kids isn’t dead, nor is it in dire straits. However, the “old” 4Kids that so many people are so familiar with, consisting of animation production and broadcast management teams, is no more, with Konami and Saban snatching up those businesses as part of the trio’s deal. 4Kids still exists as a licensing company, just as it once was before it made it big with Pokemon. It is still holding on to various properties (including animated children’s titles). And it is still headquartered in the same location in Manhattan. 4Kids’ settlement with Japanese Yu-Gi-Oh! licensors TV Tokyo and NAS, along with its successful assets sale to Konami and Saban, have left the company with mountains of cash. Since the end of July, 4Kids has been looking to settle the other legal proceedings it is involved in, including one with The Pokemon Company International over various alleged “deficiencies” in payments (which I briefly touched upon when the Yu-Gi-Oh! lawsuit first made news in March 2011). It had also been looking at liquidating its London-based subsidiary 4Kids Entertainment International, the plans for which were finalized on September 30, 2012. On the same day, Michael Goldstein, the Interim Chairman of 4Kids’ Board of Directors who assumed the position in May 2011, also retired. What will happen next with 4Kids? Will the company exit Chapter 11 bankruptcy protection and continue to trudge along, seeking out new properties to license in hopes of finding the next big hit? Will another company take a fancy to 4Kids and buy it out? Or will 4Kids use this opportunity to wind down and cash out while it is on top? After 4Kids files its disclosure statement today, any parties with a vested interest in the fate of the company will have until October 25 to file an objection. A hearing to okay the disclosure statement is scheduled for October 30. Konami, Saban, and 4Kids are kicking up some dust as the trio continue to sort through the properties that recently changed hands. All Yu-Gi-Oh! episodes, including videos from the Yu-Gi-Oh! GX, 5D’s, and Zexal series, have been removed from Toonzaki.com, the anime video hub previously managed by 4Kids (and now by Konami). This is especially unfortunate because the Toonzaki crew had worked to build up the website so that it appeared among the top search engine results for queries of Yu-Gi-Oh! videos. There’s no need to panic though, as all of the Yu-Gi-Oh! videos are still currently available on Hulu. If you can’t find a former 4Kids show that you’re looking for (Yu-Gi-Oh! or otherwise), do a search on Hulu and you’ll likely find it there. It’s yet to be seen whether any Konami or Saban websites will pick up the Yu-Gi-Oh! feeds on Hulu for distribution. I’ll update my Yu-Gi-Oh! and Yu-Gi-Oh! Capsule Monsters streaming video pages with new links once the dust settles. In more positive news, MyVortexx.com, the official website of Saban’s Vortexx Saturday morning block, went live earlier this afternoon! It’s still looking a tad empty, but a Vortexx rep noted on Facebook that there’s much more to come, so keep your eyes peeled! Meanwhile, 4Kids.TV (Toonzai.com) and 4KidsTV.com continue to be disassembled, with former 4Kids properties being removed from both websites. Update (August 31): “We are transitioning the site,” says a Toonzaki rep on Facebook. “[I]t may be spotty the next few days – shows disappearing/reappearing, site being down etc etc but we’ll be back and better than ever in no time!” Hopefully that includes all of the Yu-Gi-Oh! series!